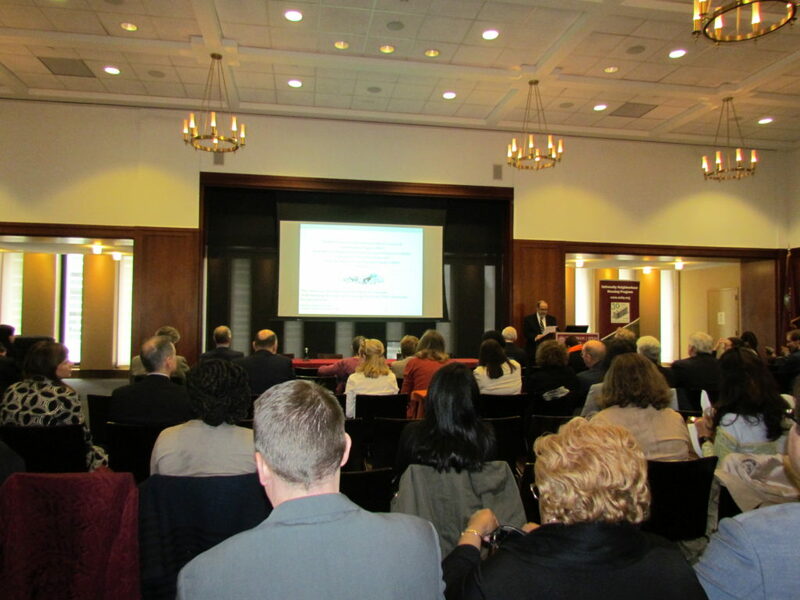 On October 29th 2018, Fordham IPED along with the Association for Neighborhood and Housing Development, Enterprise Community Partners, and University Neighborhood Housing Program sponsored the CRA at a Crossroads Forum: Understanding the Impact and Ensuring the Future of the Community Reinvestment Act. 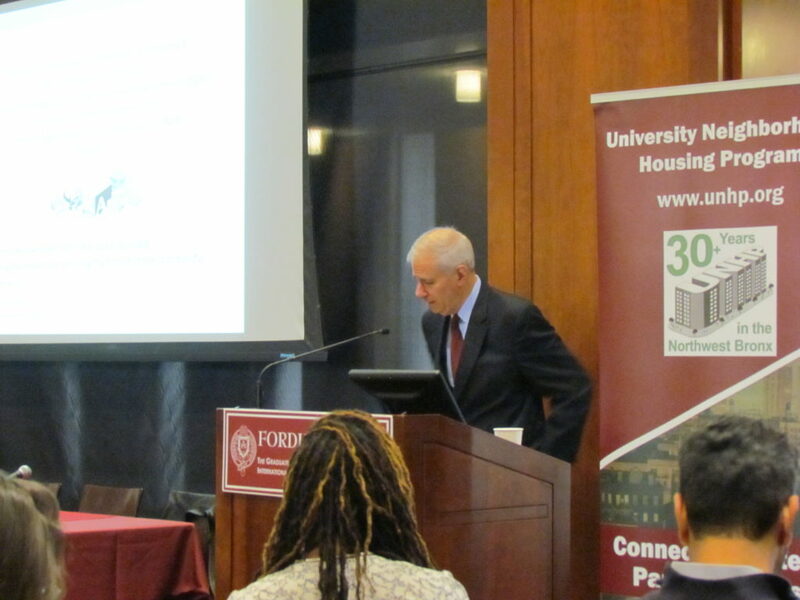 The event, held at Fordham’s Lincoln Center Campus included an array of speakers including two IPED alumni: Elizabeth Strojan, VP for Government Affairs for the NYC Housing Development Corporation and Department of Housing Preservation and Development (IPED ‘13) and Will Spisak, Director of Programs at Chhaya CDC (IPED ‘14). Following IPED Director and University Neighborhood Housing Program Vice President, Dr. Henry Schwalbenberg’s opening remarks, Martin J. Greunberg (Member of the Board of Directors, Federal Deposit Insurance Corporation) gave a speech entitled The Community Reinvestment Act: Its Origins, Evolution, and Future. In it he discussed the changes to the Community Reinvestment Act since its enactment in 1977 and its goal of fighting against the effects of redlining and disinvestment by obligating banks to meet local needs. Panelists included the aforementioned IPED alumni along with Jaime Weisberg, (Senior Campaign Analyst at the Association for Neighborhood and Housing Development) and Jim Buckley (Executive Director of University Neighborhood Housing Program). Weisberg discussed ANHD’s work on preserving and improving the CRA. ANHD conducts research on the “State of Bank Reinvestment in NYC”, regularly comments on CRA exams, and advocates for banks to have “forward-looking CRA plans”. ANHD works towards addressing the “predatory equity” crisis and advocating for banks to engage in responsible multifamily lending to ensure that their loans do not lead to more displacement in the city. Buckley discussed how organizers and Bronx tenants in the 1970s were able to use the CRA to improve housing conditions and in have continued to use it as a means of aligning banks with their community development efforts. Currently, UNHP promotes further improvements in financial services for Bronx residents and for targeted private investment in the area. Some of their recent work can be found and the following links: CRA’s Bronx Impact, The Bronx Banking Guide, Bronx Financial Services Survey, improved financial access for immigrants, and the impact of alternative financial services. 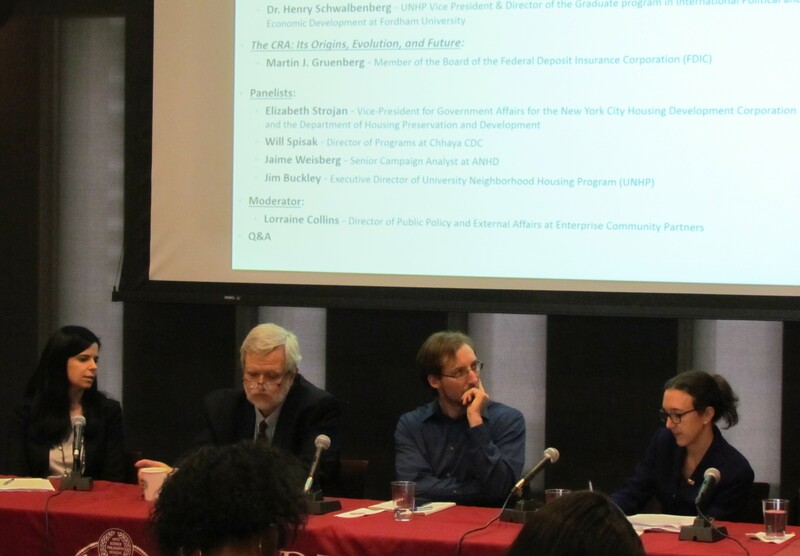 Strojan discussed the role of the CRA in affordable housing preservation in NYC and how it leverages bank loan investments for affordable housing and allows the City’s investments to have a more meaningful impact. Spisak discussed the benefits of the CRA for immigrant communities, especially the South Asian and Indo-Caribbean communities that Chhya represents in Queens. Additionally, he touched on the importance of working towards providing more banking and loan services for small businesses.